The top mount chimney caps are perfect when you need to cover multiple, odd sized, or unlined flues. These caps also have a more finished, professional look and protect the entire top of the chimney. 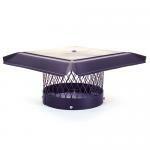 The top mount chimney caps come with lids that are easy to remove for chimney cleaning. 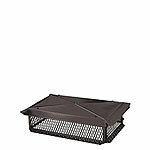 We carry stock sizes available for same day shipping in sizes to accomodate any size chimney and desired screen height. The stainless steel and copper top mount chimney caps come with a lifetime warranty and are the ideal solution for homeowners wanting a more customized look for the top ot the chimney. The top mount designer lid chimney caps are available in all of the same stock sizes as the flat lid top mount caps and add a beautiful hip and ridge lid that will give the top of the chimney a customized look at a muuch lower price than a custom cap. Chimney Caps for Top Mounting offer the combination of covering one or multiple flues and protecting the entire top of the chimney. They also provide a custom look and we have sizes to suit any need Chimney Caps Top Mount with Designer Lids add a stylish angled lid and offer the combination of covering one or multiple flues and protecting the entire top of the chimney. 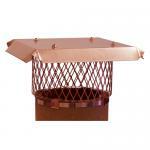 They provide a unique look and we have sizes to suit any need Chimney Caps Copper Top Mounting Copper offers the ultimate look for protecting the entire top of the chimney. They provide a classy look and we have sizes to suit any need Chimney Caps Copper Top Mount with Designer Lids add a stylish angled lid and copper offering a statement look for covering multiple flues and protecting the entire top of the chimney. Black Galvanized, Stainless Steel and Copper Chimney CapsBlack Galvanized chimney caps are great for customers looking to save money but still want a high quality cap that will last. 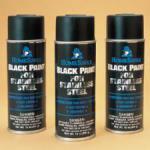 Stainless steel is our most popular due to the lifetime warranty and great value. Copper chimney caps are for the customer who wants a beautiful cap for a classy look. 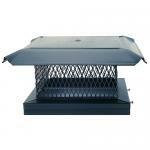 We carry chimney caps from all the leading manufacturers including Gelco, HomesaverPro, HY-C, ICP and Whitecaps. All of these chimney caps are easy to install and are the highest quality available. 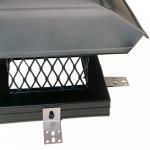 These black galvanized chimney caps offer solid protection at a great price. 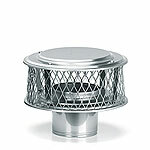 They also come in stainless steel and should be used on furnace flues. Metal Pipe Chimney Caps We have chimney caps for solid pipe/pack flues, double or triple wall air insulated chimney pipes and flexible chimney liners. 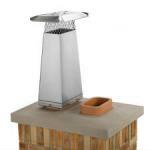 All of these chimney caps are Stainless Steel and come with a Lifetime Warranty. An air insulated chimney consists of an inner pipe surrounded by 1 or 2 more pipes with air space between the pipes. A solid pack chimney is a singular pipe consisting of an inner and outer wall with insulation between the two. All ot these chimney caps are fully assembled and ready to install. 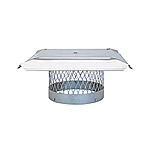 Both styles of these chimney caps are simply installed by friction fit - no tools are needed Round Chimney Caps for Metal Pipes We also offer chimney caps for both solid pack and air insulated metal chimneys . Stainless Steel and Copper Round Chimney Caps We carry these in hard to find larger sizes. 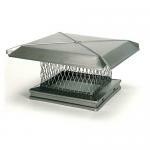 Black Galvanized Chimney Caps for Sqaure and Rectangle chimneys These offer solid protection for a great price. 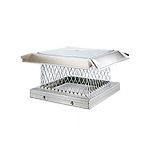 Stainless Steel Chimney Caps for Sqaure and Rectangle chimneys These offer lifetime protection at the guaranteed best price. 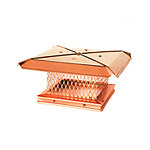 Copper Chimney Caps for Sqaure and Rectangle chimneys These offer lifetime protection and a stylish look for your chimney. 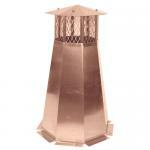 Copper Chimney Pots can cover round, sqaure or rectangle openings These also offer added height for function and apperance and a lifetime warranty. 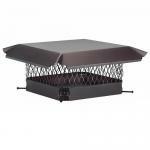 Customer Satisfaction Guaranteed Any Chimney Cap purchased from FireplaceEssentials.com will withstand the elements and will have high quality construction. Our customers always enjoy the added confidence of knowing that our 30-day money back guarantee demonstrates our commitment to complete customer satisfaction. Another advantage of ordering from us is our prompt delivery policy. Most chimney caps are shipped the same day they're ordered and for free if the order is over $ 100.